In late Spring 2017 Pittwater Online News will commence a run of history pages sharing some insights into Pittwater fishermen and fisher families - which began with our local indigenous families, and early settlers like the Chinese men that occupied and processed fish where the Palm Beach ferry wharf is, but then included those who came to live and survive here earlier than that, from 1788 on. Recently receiving a pre release copy The Catch: The Story of Fishing in Australia by Dr. Anna Clark, made available by the National Library of Australia on October 1st, 2017, gives a standard to aspire to. Dr. Anna Clark is an Australian Research Council Future Fellow and Co-Director of the Australian Centre for Public History at the University of Technology in Sydney. In 2003, she was awarded the NSW Premier's Prize for Australian History and the Queensland Premier's Prize for Best Literary or Media Work Advancing Public Debate for The History Wars, co-authored with Stuart Macintyre. Putting aside this author's penchant for going the distance, this new book charts the history of fishing, from the first known accounts of Indigenous fishing and early European encounters with Australia’s waters, to the latest fishing fads; from the introduction of trout and fly fishing to the challenges of balancing needs of commercial and recreational fishers. As many here enjoy fishing as an occupation or a recreation, with our tall fish tales to tell, and with so much of our environment's seasons entwined with fish runnings, with fish spots, with sharks in the Pittwater estuary or around the lighthouse, or catches of legendary prawn runnings in the Narrabeen Lagoon, catching eels in Warriewood's creeks - this is book many of us may resort to to whet our appetite to get out and enjoy what lies on our doors. This book is written by someone who has a passion for fishing and a passion for sharing accessible knowledge all framed in a beautifully presented volume - does the NLA ever do anything but allow its great records to create works of art that celebrate sharing knowledge? After chiming of 'the enduring pleasure of throwing in a line', and harnessing the tide that must have saved early settlers from starvation, all that netting, and all that 'excursionist' traffic that came here too, many of the visitors simply to fish, was certainly going to lead to the need for regulation, Anna's work delves into the Old Fish introduced into a New World. The Anglers, fishing evolutions and of course, the charting of a more certain realisation by the 1960's that things need to shift if people wish to go recreational fishing. Anyone who has spoken to those who fished here only a few decades ago know the snapper aren't almost ten pounds in weight anymore and the open fishing rowing boats aren't coming back filled to the bream with mackeral. The work covers the whole of Australia, sharing societal shifts, luminous paintings, items from magazines and periodicals past and photographs. It charts our love of fishing and the great outdoors as no work has done so far. We're not going to run a spoiler here but if you'd like to meet this wonderful wordsmith, Berkelouw's at Mona Vale are hosting the author on Thursday October 12th for a focus on this new work- certainly one for fishers, historians and art lovers alike - details below. Pages 82-83: Fishing, a sketch in Mossman's Bay, Port Jackson [picture] / S.M- Creator Gibbs, Shallard & Co. In every coastal town in Australia, there's a bait shop and a boat ramp, and, in garages around the country, fishing rods are strung up waiting for their next outing. Many of us have a special fishing spot, and families pass on tips from generation to generation and exchange fishy tales of amazing catches and near misses. Bringing her personal passion for throwing in a line, author Anna Clark celebrates the enduring pleasure of fishing in "The Catch: The Story of Fishing in Australia". This book charts the history of fishing, from the first known accounts of Indigenous fishing and early European encounters with Australia's waters to the latest fishing fads; from the introduction of trout and fly fishing to the challenges of balancing needs of commercial and recreational fishers. Fishing personality Rob Paxevanos, host of "Fishing Australia", says that "The Catch" is 'by far my best fishing read to date'. You are invited to meet Anna Clark when introduces her new book The Catch - The Story of Fishing in Australia. In every Australian coastal town, there's a bait shop and a boat ramp and, in garages around the country, fishing rods await their next outing. Many of us have a special fishing spot and from generation to generation, families pass on tips and exchange fishy tales of amazing catches and near misses. 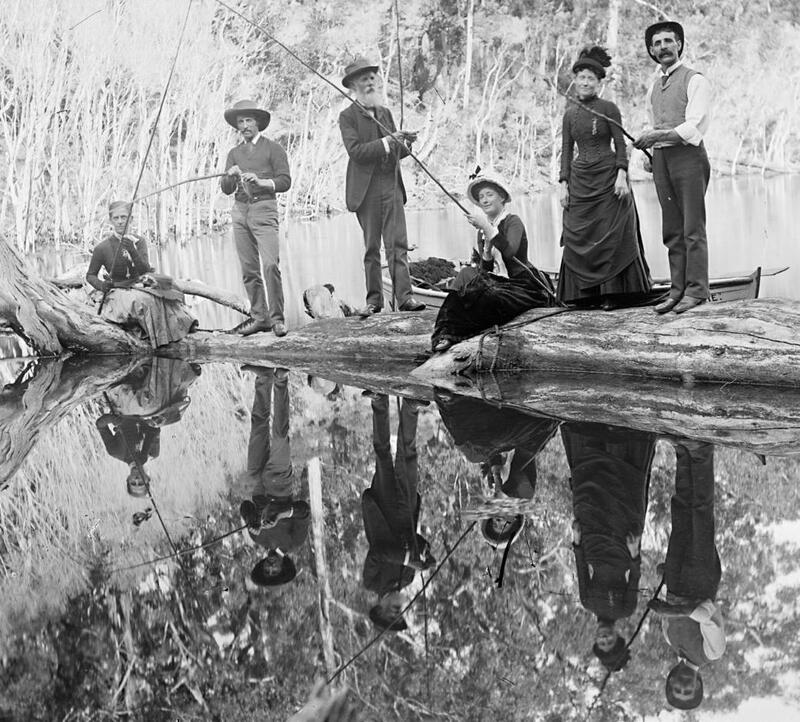 Now the rich history of Austalian fishing has been told. In her new book avid fisher Anna Clark celebrates the enduring pleasure of fishing and gives a unique insight into its history from the first known accounts of indigenous fishing and early European encounters with Australia's waters, the the latest fishing trends; from the introduction of trout and fly-fishing to the challenges of balancing the needs of commercial and recreational fishers. Dr. Anna Clark is an Australian Research Council Future Fellow and Co-Director of the Australian Centre for Public History at the University of Technology in Sydney. In 2003, she was awarded the NSW Premier's Prize for Australian History and the Queensland Premier's Prize for Best Literary or Media Work Advancing Public Debate for The History Wars, co-authored with Stuart Macintyre. Her most recent publication is Private Lives, Public History (2016). 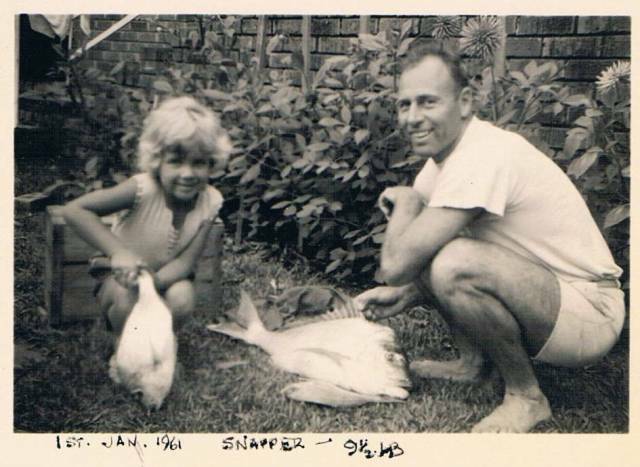 The Catch, her seventh book, is a perfect marriage between her love of fishing and her passion for Australian history. Join us at 6.30pm on Thursday October 12th when Anna Clark introduces her new book. Bookings are essential and can be made online by following this link (fees apply) or by phone on 9979 2112. Cost is $ 14.00, $ 5.00 of which will be credited against any purchases made on the evening. Gows (Carl Gow second from left), Gonsalves (FRank Gonsalves fourth fro left) and Laurie Gallagher - last at far right of picture in Palm Beach SLSC 'speedos'. 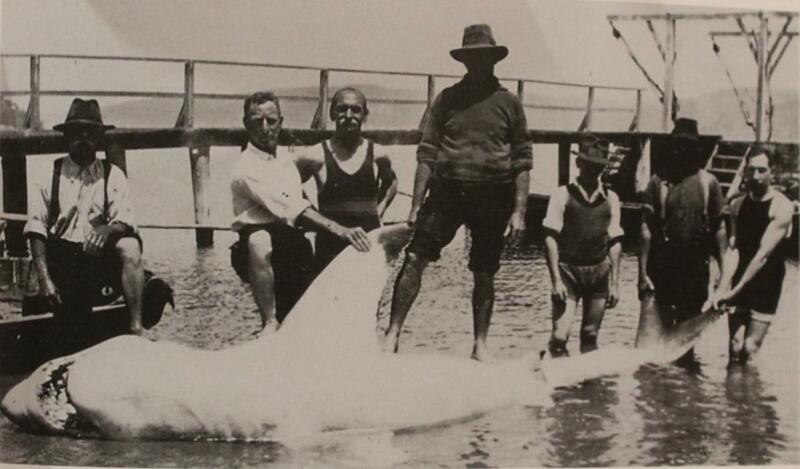 - mid 1930's at Gonsalves-Gow jetty, just north of current palm Beach ferry wharf, with a shark caught in the estuary.